[ The Earl of Derby and the disestablishment of the Church of Ireland. ] Speech of the Right Hon. The Earl of Derby, K.G., on the Established Church (I(reland) Bill, in the House of Lords, 25th June, 1868. London: Printed by Permission of The Right Hon. The Earl of Derby by "The National Union" of Conservative and Constitutional Associations, 9, Victoria Chambers, Westminster, S.W. 1868. 16pp., 12mo. Stitched and unbound. In good condition, lightly aged and worn, with central vertical fold. In small print. Derby regards 'the disestablishment and disendowment of the Church of Ireland' as a 'dangerous measure', and urges the House of Lords to ward off its 'incalculable evils'. According to his entry in the ODNB, 'In February 1868 a rapidly ageing and sick Derby resigned from the premiership, handing the office over to Disraeli. Derby also resigned the formal leadership of his party in the Lords. [Printed item.] National Union of Conservative and Unionist Associations. Speakers' Competition, 1936. Notes for Competitors & Judges. + 6pp., 12mo. On six leaves, stapled together in one corner. In good condition, on lightly aged paper. 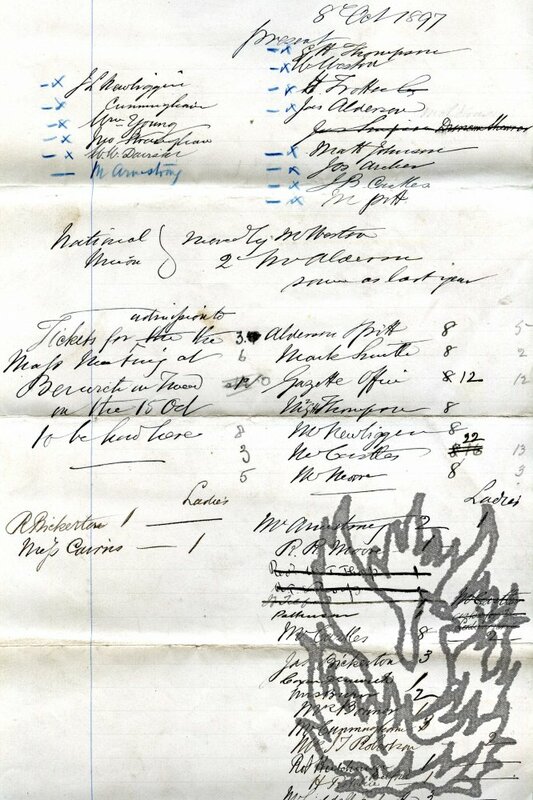 Main headings: 'General Conditions', 'Special Notes' [sub headings for Chairman (Elocution and Manner; Subject Matter; Procedure; Manner of Handling Meeting); Speaker; Proposer and Seconder; Team Work], 'The National Anthem', 'Marking Sheets' and 'Declaring Result'. Scarce: no copy traced on either COPAC or OCLC WorldCat. Manuscript document, naming those 'present' and 'Tickets disposed of' at a 'Mass Meeting Berwick [on Tweed]', 1897. Document dated 15 October 1897. Folio, 1 p. Docketed on reverse: '15 Oct 1897 | Mass Meeting Berwick | Tickets disposed of'. Text clear and complete. Fair, on lightly-aged paper. In double-column, in at least two hands. Additions in pencil and blue pencil. The Times, 16 October 1897, carried a report of the event, described as the 'greatest political gathering ever held in Northumberland outside Newcastle-upon-Tyne'. Apparently a document produced in the run up to the meeting. List of the members of the club of "Nobody's Friends". See 'The club of 'Nobody's Friends' 1800-2000: a memoir on its two-hundredth anniversary' by Geoffrey Rowell (2000). Four-page bifolium. Good, on grubby, discoloured paper, with some creasing and wear at foot. 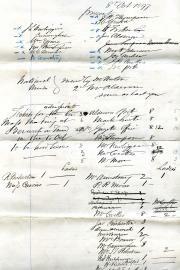 Gives details of the election between 1820 and 1877 of fifty-nine Actual Members, and of eighteen Honorary Members. Includes the Rev. Charles Burney, the artist George Richmond and the publisher John Murray.